Newspaper Rock: Tonto as a "spirit warrior"
Rose helped the actor come up with his now iconic Captain Jack Sparrow costume for the "Pirates of the Caribbean" franchise. By Elizabeth SneadIf Johnny Depp’s costume and makeup in the just-released first look at The Lone Ranger looks a little over the top, that shouldn't come as a huge surprise. After all, he’s working with his Pirates of the Caribbean costume designer Penny Rose, who worked on all four Pirates movies (Curse of the Black Pearl in 2003, Dead Man’s Chest in 2006, At Worlds End in 2007, and On Stranger Tides in 2011). To say the actor and the costume designer have a very good rapport would be putting it mildly. It was Rose who initially gave Depp a wide selection of pirate hats. He went through them all, tried them on and picked the only one that he felt gave him just the right rock 'n' roll pirate swagger. Rose then had a dozen made up just like it. Now Depp's young fans around the world are wearing them. So if Depp is wearing a dead raven on his head in the first Lone Ranger image--tweeted out by producer Jerry Bruckheimer today--you can bet it’s something he and Rose dreamt up together. Let’s just hope he doesn’t wear his war paint during the entire movie. But then again, we initially said the same thing about Capt. Jack's eyeliner and dreads. Given that Disney came embarrassingly close to firing Depp for his stumbling drunken Captain Sparrow character, we’re willing to bet they will let him run with this new creation, who is now being called a 'Spirit Warrior. 'Comment: Not surprisingly, the Pirates designer came up with Tonto's Flying Nun look. This article implies what I thought: that they're making up Tonto without reference to actual Native clothing or culture. And they're calling Tonto a "Spirit Warrior," which raises a red flag. Because all Indians are spirit warriors, right? Who talk to ghosts and animals and stuff? I wonder if we're going to miss the days when Tonto was just an average Joe with no "spiritual" beliefs. There's absolutely no truth to the rumor that with his crow headdress, Tonto will be able to fly like the Flying Nun. Because that would be silly. 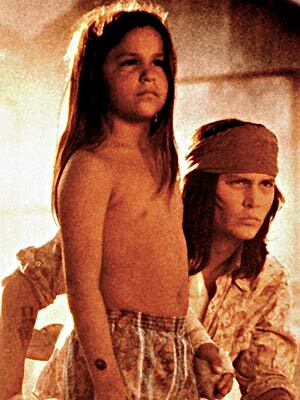 What are the odds of Depp's Tonto being a normal guy like Chief Dan George in Little Big Man? I'm betting he'll sound all wise and spiritual like a bad fortune cookie. "When the raven flies, your destiny awaits." Stuff like that. Johnny Depp wanted a parrot in Pirates of the Caribbean. Instead he got a talking raven in The Lone Ranger. It's his spirit animal and it whispers secrets to him. Tonto: How long till we get there? Penultimate Fake Indians say: "We love Johnny Depp's crow headdress! It's all weird- and ethnic-looking! Like he's from a different planet or something! ‎"And he looks like he's crying. He's sad because of all the bad things done to his people. Poor sad Tonto." My buddy Ron and I discussed the "spirit animal" concept:Is this "whispering spirit raven" concept at all believable? I mean, is it something that Native Americas believed in "back in the day?" I wasn't expecting any facepaint. I had a mental image of Lou Diamond Phillips from the Young Guns movies in my head.I think most of the "spirit animal" thing is New Age mythology, not genuine Native belief. If it's genuine, it probably happens most most often in dreams or on vision quests. People don't carry an animal around or expect answers from one on a daily basis. As for his looks, I kind of thought Tonto would look like this--not like Thor with waist-length hair and a winged helmet. For more on the subject, see Johnny Depp in a Crow Headdress and Sources for Depp's Crow Headdress. More seriously, though, "spirit warrior"? I mean, I'm fine with reimagining Tonto as Sancho Panza and would actually recommend it, but "spirit warrior"? Must we?